Three employees gave three minute soapbox talks (a recent tradition at our company meetings). Energy Manager Rob Meyers explained what happens once sunlight hits a solar panel (the physics of how electrical energy is made and where the energy travels to and how). With a lot of heart and soul (and laughs), carpenter Primo Lombardi talked about “what it means to be a carpenter” (he held up a piece of rigid foam insulation, turned to me, and wondered if I could find him a piece of wood from the shop, because he “can’t seem to find one on the jobsite.” The carpenters are not enamored of the thick rigid foam with which we often wrap buildings these days). 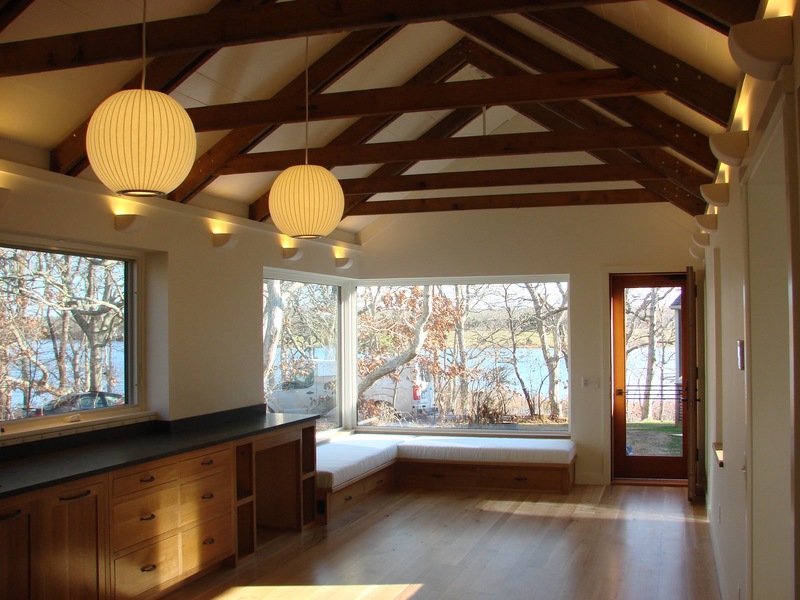 “The house is absolutely perfect. I was in love the minute I walked in the door. It’s beautiful. The view! The windows! The light! The beams! The floor! The doors! Thank you for all the thought & work you put into it and for helping us make decisions and, well, for everything. We couldn’t be happier with the results. The people on the crew were great. It’s always a treat to work with South Mountain. Gratifying stuff. Here they are, on moving-in day . . .
We then recognized some people who had reached milestones at SMCo; Rocco Bellebuono 10 years, Deirdre Bohan and Phil Forest 20 years, and even me (40). There are 10 others who have been at SMCo between 10 and 20 years, and seven others who have been here between 20 and 40. Phil and Deirdre have had particularly interesting career trajectories at SMCo. When Phil came he was an ace woodworker who had run his own shop. But at SMCo he tired of woodworking after a few year; he was looking for something different. We tried him at a few positions – production manager, product sales, etc. Nothing was quite working or truly satisfying. Then, seven or eight years ago, when our solar business started to take off, Phil became the lead installer. He loved it. His work had meaning and he loved the constant new challenges. He still does. After years of struggle to find his right place in this company, Phil made himself into the best damn solar installation guy there could possibly be. He trains the installers and interns. He even instructs the electricians and electrical inspectors! He knows his business. He’s dedicated to what he does and passionate about it. He sets the highest standard for quality. Nobody does it better. He found his place. Along those lines, Deirdre’s story is a classic. It’s not short, so I’ll tell it in a future post. These are tales of work migration, about people who move from one region of the company to another until they find their perfect habitat. It shows that it’s possible, even in a small business like ours, to provide diverse opportunity. At the end of the meeting, before the Appreciations with which we end all meetings (we learned that from our friends at Zingerman’s in Ann Arbor), we did another recent ritual, the passing of The Fork. 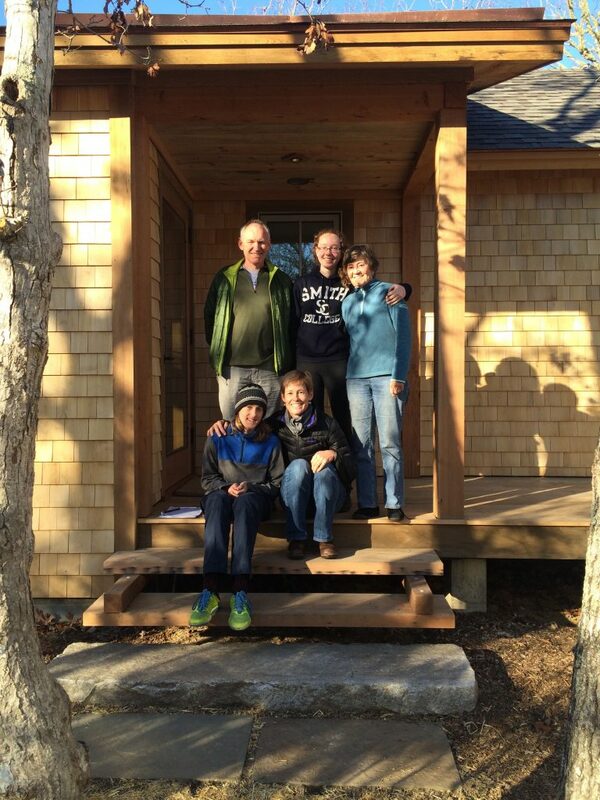 Remember I mentioned that Phil was quite a woodworker? His skills remain intact. One day last year he walked into my office with a wooden fork. Not just any wooden fork. 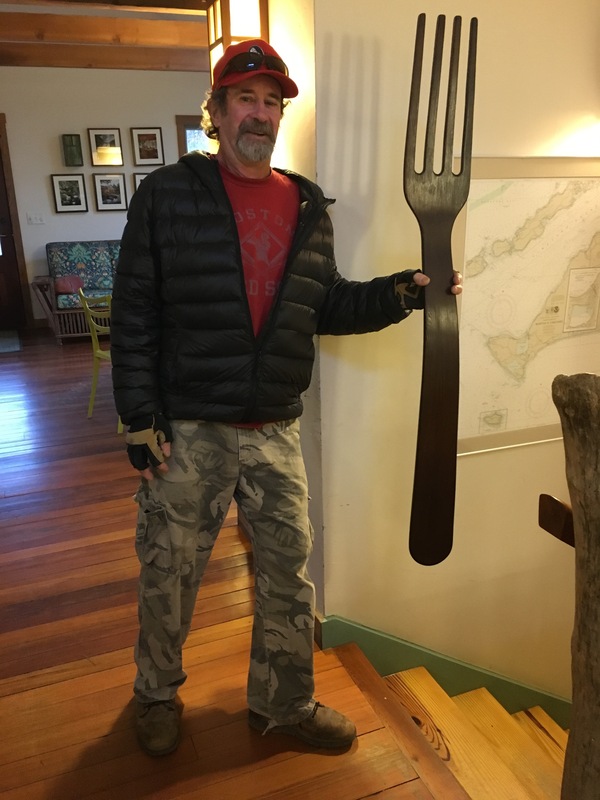 This custom made wooden fork is 4’ long – more sculpture than utensil. “What’s that beautiful thing, Phil?” I asked. The inspiration for Phil’s fork was foreman/owner Billy Dillon’s saying, “Stick a fork in it.” He’s been saying that for as long as I can remember, probably 25 years at least. It’s an old saying that means, “It’s done.” In Billy’s world it means that the frame is done. Or the roof is done. Or the door is hung. Bell is rung. Song is sung. Day is done. Whatever. Stick a fork in it. We decided that each company meeting we would give the fork to someone in the company, someone deserving of special recognition, someone who gets things done, to hold until the next company meeting. The current fork-holder would decide who would be the next fork-holder and pass the fork on to him or her. In honor of Billy’s inspiration Phil chose to make him the first fork recipient. He did. And it has been passed on several times since. At this meeting, it was passed from Curtis Friedman to Pete Ives, who is the last remaining SMCoer from the way early days, besides me. Pete will soon to start his 39th year here. He has been a wonderful co-owner, friend, and partner in crime, and I love him dearly! Eat well, Pete. You deserve it. Enjoy the holidays. And Happy Holidays to all of you from all of us at SMCo. We wish you a great year in 2016. Let’s hope it’s the year during which the parade of presidential wack jobs – who have the nerve to stand before us at the Republican debates – follow each other like lemmings onto an offshore oil platform or deep into a coal mine. And stay there, safely stowed, while Bernie Sanders helps us all change America!